Easy to make, and totally adjustable to suit your taste, this Dry Ranch Seasoning is homemade from scratch! You will notice that it doesn’t contain any salt, as I like the flavour of Ranch, but not all the sodium that comes in those little packages. Adjust the seasoning to taste in recipes that call for Ranch Seasoning. 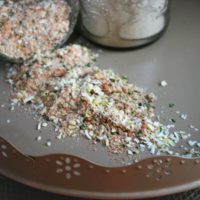 This Dry Ranch Seasoning Mix allows you to control the salt, adjust the other seasonings (I like lots of dill for example) and is budget friendly. I make large batches of this Dry Ranch Seasoning, and use it in many of my recipes. Dry Ranch Seasoning mix made from scratch allows you to reduce cost and sodium with just 5 minutes of prep. Adjust the balance of seasonings to suit your taste. Combine all ingredients in a small mixing bowl. Transfer to an airtight jar and label. Enjoy! For more great recipes, meal plans, LIVE streamed Quick Cook and Meal Prep Video’s plus so much more, join the Love on a Plate community now. We also have a YouTube channel, that’s new but growing, I’d love it if you would subscribe!